Indian lunar orbiter. First Indian lunar orbiter. It released the MIP impactor. Lunar lander operated by ISRO, India. Launched 2008. Status: Operational 2008. First Launch: 2008-10-22. Last Launch: 2008-10-22. Number: 1 . Gross mass: 1,304 kg (2,874 lb). Height: 1.50 m (4.90 ft). Diameter: 1.50 m (4.90 ft). The Chandrayaan-1 spacecraft was launched from the Satish Dhawan Space Centre, SHAR, Sriharikota by PSLV-XL (PSLV-C11) on 22 October 2008 at 06:22 hrs IST in an highly elliptical initial orbit (IO) with perigee (nearest point to the Earth) of 255 km and an apogee (farthest point from the Earth) of 22,860 km, inclined at an angle of 17.9 deg to the equator. In this initial orbit, Chandrayaan orbited the Earth once in about six and a half hours. The LAM was fired again on 26 October at 07:08 hrs IST to take the Chandrayaan-1 spacecraft to extremely high elliptical orbit with apogee 164,600 km and perigee at 348 km. Chandrayaan-1 took about 73 hours to go round the Earth once. On 29 October, orbit raising was carried out at 07:38 hrs IST to raise the apogee to 267,000 km and perigee to 465 km. Chandrayaan's orbit extended more than half the way to moon and took six days to orbit the Earth. On 4 November at 04:56 hrs IST, Chandrayaan entered the Lunar Transfer Trajectory with an apogee of 380,000 km. On 8 November at 16:51 hrs IST, the spacecraft's Liquid engine was fired to reduce its velocity to insert the spacecraft in the lunar orbit (LOI) and enable lunar gravity to capture it. As a result, the spacecraft was in an elliptical orbit with periselene (nearest point to the moon) of 504 km and aposelene (farthest point from the moon) of 7,502 km. The first orbit reduction maneuver was carried out successfully on 9 November at 20:03 hrs IST. Thus the spacecraft was in lunar orbit with 200 km periselene. The aposelene remained unchanged (i.e. 7,502 km). After careful and detailed observation, a series of three orbit reduction maneuvers were successfully carried out and the spacecraft's orbit was reduced to its intended operational 100 km circular polar orbit on November 12. On 14 November at 20:06 hrs IST, the Moon Impact Probe (MIP) was ejected from the Chandrayaan-1 spacecraft and hard landed on the lunar surface near the South Polar Region at 20:31 hrs IST after 25 minutes journey. It placed the Indian tricolor, which was pasted on the sides of MIP, on the Moon. Thereafter the scientific instruments/payloads were commissioned sequentially and exploration of Moon with the array of onboard instruments was undertaken over a planned two-year duration. The spacecraft was cube-shaped, with a mass of 1380 kg at launch and 675 kg at lunar orbit. It accommodated eleven science payloads and was 3-axis stabilized using two star sensors, gyros and four reaction wheels. Power generation was through a 30� canted single-sided solar array that provided the required power during all phases of the mission. This deployable solar array consisted of a single panel generating 750 W of peak power. During eclipse, the spacecraft was powered by Lithium ion (Li-Ion) batteries. A bipropellant integrated propulsion system was used to maneuver the spacecraft from an elliptical earth orbit to translunar injection, to brake into lunar orbit, and for orbital and attitude adjustment while orbiting the Moon. The propulsion system carried enough propellant for a mission life of 2 years, with adequate margin. An X-band, 0.7m diameter parabolic antenna was used for payload data transmission. The antenna employed a dual gimbal mechanism to track the earth station when the spacecraft was in lunar orbit. The Telemetry, Tracking & Command (TTC) communication was in S-band. The spacecraft had three Solid State Recorders (SSRs) onboard to record data from various payloads with capacities of 32 Gb, 8 Gb, and 10 Gb. 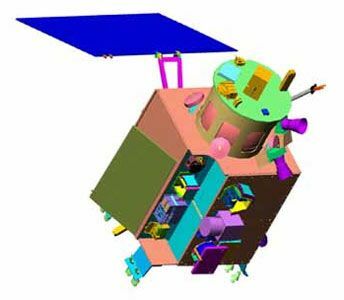 MIP: Moon Impact Probe (MIP) as piggyback on the main orbiter of the Chandrayaan-1 spacecraft, which will impact on the surface of the moon. C1XS: Chandrayaan-1 X-ray Spectrometer (C1XS) through ESA - a collaboration between Rutherford Appleton Laboratory, UK and ISRO Satellite Centre, ISRO. Part of this payload is redesigned by ISRO to suit Chandrayaan-1 scientific objectives. SARA: Sub keV Atom Reflecting Analyzer (SARA) through ESA, from Swedish Institute of Space Physics, Sweden and Space Physics Laboratory, Vikram Sarabhai Space Centre, ISRO. The digital processing unit of this payload/ experiment is designed and developed by ISRO, while Swedish Institute of Space Physics develops the payload. RADOM: Radiation Dose Monitor Experiment (RADOM) from Bulgarian Academy of Sciences. Family: Lunar Orbiters, Moon. Country: India. Launch Vehicles: PSLV, PSLV-XL. Launch Sites: Sriharikota. Agency: ISRO. Bibliography: 6410, 12178.